As you may know, I love to use my hand planes. For a while I’ve been wanting a smoothing plane that was smaller then my No. 4. I finally pulled the trigger and bought a Lie-Nielsen No. 2. This is my review of the plane after using it for a few weeks in my shop. A quick review of the Veritas Mark II Narrow-Blade Honing Guide. For years I’ve used the regular Mark II Honing Guide and recently purchased the Narrow Blade Guide. I found the new clamping guide is perfect for using with chisels. After finishing my new sharpening pond, I wanted to put it to the test. In this video I go over how I flatten the back of a chisel, reground it’s primary bevel and put on a secondary bevel. After that, I touch up the blade for my Smoothing Plane and take some very thin shavings. A quick review of the Veritas Variable Burnisher. A great tool that helps make card scraper sharpening a breeze. I’m in heaven surrounded by Bronze. This past Christmas my girlfriend bought me the plane I’ve been wanting to buy for myself for years, a Lie-Nielsen Bronze #4 Smoothing Plane. After using it for the past six months I couldn’t be happier. I have to admit, I’m in love with all tools made in Bronze. I find the color warming and feel of the metal as if it was forged to be placed in human hands. Besides all the romantic notions of this tool, how does it perform? In a word – excellent. That however is dependent on the user. Some time ago I learned that if you don’t keep your tools sharp, it doesn’t matter how much they cost. At the end of every project I take note of the tools I used and add them to my list of items to either tune-up or sharpen. With the plane blade finely sharpened, this plane is a dream come true. The weight is perfect. The handles feel good in your hand. In the end there is nothing more rewarding than the glass smooth finish it leaves you. I tend do work a lot in Mahogany and Walnut, but I’ve also worked in Oak on many projects in my woodworking life. Before I start my next project in Oak, I will take a serious look at purchasing the 55 Degree High Angle Frog for what’s referred to as a Middle Pitch that is 5 Degrees higher than a York Pitch. The steeper the angle the easier it is to smooth difficult woods. Of course, if I won the lottery, I might have one in all three Pitches. But to dream. 12 inches of jointing and planing in a small space. I’m in my second year of owning the Hammer A3 31 by Felder and I don’t regret a moment of it. 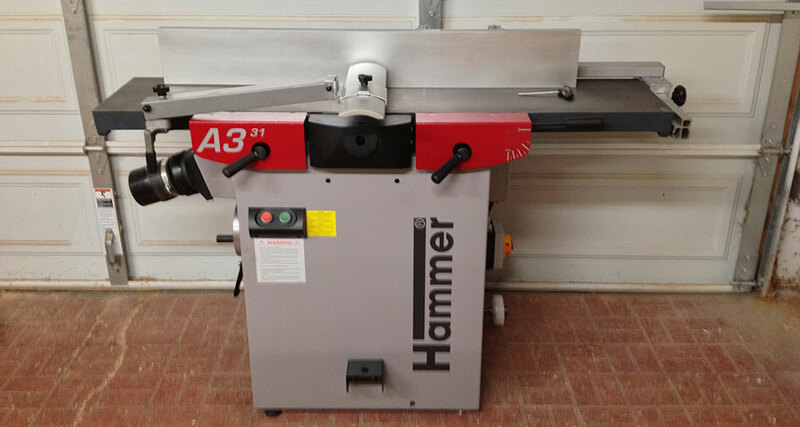 When I started woodworking I bought a 6″ Craftsman professional jointer. Now, that was a great jointer. Never had any problem with the table alignment. Buying new blades were as easy as driving to the local Sears and let me tell you, it was a workhorse. As my woodworking became more complex and my projects required parts that were wider than 6 inches it was time to upgrade. At this point, I had taught myself to mill up wider lumber by hand, or at least flatten one side, but I wanted something more. 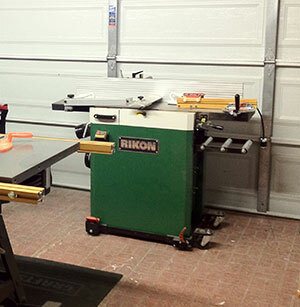 I did a little bit of research and out of the blue Rikon introduced a 12” jointer planner combination machine. To top it off, it was half the price of anything else on the market. I was sold! Should have listened to her. Six months into owning my new green machine, I noticed that the tables were no longer co-planner. What had happened? The beds are bolted onto the frame with three bolts on each side of the frame. Six bolts in total per bed. After doing a little bit of reading I found out I wasn’t the only one with this problem and it wasn’t just limited to the Rikon. The Jet and other combination machines had the same problem. Fast forward a number of years and I was done. I was tired of loosening bolts and with a mallet and with a long straight edge and some feeler gauges bringing the table’s co-planner again. To craigslist the green machine would go. Don’t worry. I spent time with its new proud owner telling him all about how to re-align the tables. The Hammer is an amazing machine. Its optional digital hand wheel for the planner bed height is incredible. With a dial caliper and a few minutes you can setup the hand wheel so that you are consistently mill your boards, day in and day out to a thousandth-of-an-inch. I optioned for the straight blades instead of the helical cutter head. With a light cut and new blades I haven’t run into any issues. Blade changes are as easy as pie. The indexed – yes indexed – blades go in with no effort as well. In ten minutes or less you are back to work and both sides of the blade have a cutting edge. Jointer to planner change over time is great. A few minutes at best. Just bring the planner bed down to 6 inches and you are ready to go into jointing mode. Buy the Hammer and you will only cry once.